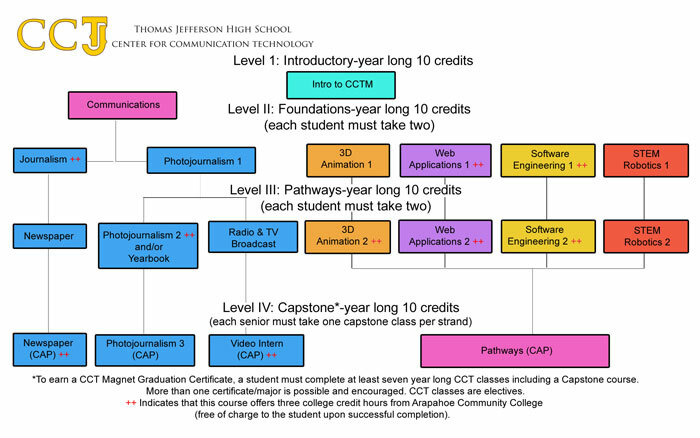 In order to provide students in the CCT Magnet program a truly unique and comprehensive experience, we require that all students take 7 CCT classes over the course of their high school career to complete the CCT certificate. In general, students will take 1 CCT class as a 9th grader and 2 CCT classes in each of their 10th to 12th grade years. The CCT classes are elective classes. This introductory course will give students an introduction to Journalism, Mass Media, and Digital Media Arts. The course will also provide the computer skills necessary for the various productions and publications at TJ. Material to be covered includes but is not limited to: desktop publishing, graphics, video and audio editing, web design, programming, 3D animation, technical writing, and formal and informal presentations. Students must complete a portfolio based on coursework, and obtain the instructor recommendations in order to be considered for further classes in the CCT program. Photojournalism 1 – In this course we will explore the basic techniques of black and white photography and color photography, as they relate to journalism, business and the arts. Students will learn to operate digital SLR cameras to capture images, and will use Adobe Photoshop to process their photos. Photojournalism 2 – Extends the basic concepts of digital imaging as applied to photography that were acquired in Photojournalism 1. Using applicable technology and hands on experience, modern developments are presented leading to the present applications of digital imaging which combine traditional photographic ideas with electronic media. Newspaper – In this yearlong course, students will write and publish articles in the online school newspaper, The Thomas Jefferson Journal, that are intended to inform, entertain, and enrich the TJ community. Students will be given assignments in the general areas of News, Community, Sports, Living & Arts, and Photojournalism, among others. Students will benefit from instruction in journalistic style and mechanics as a group, in addition to receiving intensive, individual feedback and instruction on their specific writing performance. It is our goal to train students to be excellent writers and reporters (in both style and mechanics). We believe that students will find their college and/or career paths to be highly enriched by their experience on the Journal staff. Radio & TV Broadcasting – This class will produce a 10-minute, daily news/entertainment television show that will be broadcast to the entire student body, faculty, and staff every day. The purpose of our telecast, the Spartan Edition, is to inform students of newsworthy events at TJ and it’s surrounding community, to promote school activities and programs, and to present this and other information in an entertaining and professional manner that will help to build a stronger and better-informed TJ community. This class operates just like a news department of a television station. We must produce an excellent product for publication every day of the school year. Therefore, students must be on time, enthusiastic, hardworking, and conscientious. Senior Video Intern – This two-semester course is the capstone class for the Communications Central strand of the Center for Communication Technology Magnet. Students use writing, scripting, and digital video editing and production skills acquired in all previous CCT classes to produce audio and video presentations that will be used for programming on the Spartan Edition, local student video expositions, TJ’s own broadcast system, other courses across the curriculum, and a variety of other media venues. At the end of the course, each student will have a portfolio of video productions to use for college/job applications. 3D Animation 1 – This course is the foundational level for the 3d class, students will be learning how to use state of the art 3D software to build 3D models and also learn how to animate the models. Cinema 4D, Photoshop, Illustrator, and Final Cut Pro will be used to teach the class. Topics include: storytelling, modeling, texturing, lighting, rendering and animation principles. The class is built on learning the necessary skills to create 3D models and apply basic camera animation and use simple linear timeline to create a visual presentation. Basic video editing will be used to create a final project. Students will be given the opportunity often to reflect on their work and demonstrate their understanding of key concepts in 3D. SkillsUSA will be integrated into the lesson plans to facilitate collaboration and career goals. 3D Animation 2 – This course is the Advance level in the 3D strand. Advance 3d software, graphic editing software, video editing software, video effect software, planning software, and blogging tools will be used to teach the class. Topics include: Character modeling, texturing, lighting, storytelling, team collaboration, project planning, animation and design principles. Students will learn new skills and begin creating projects that will demonstrate their knowledge skills in the course content of the class. Students will be given the opportunity often to reflect on their work and demonstrate their understanding of key concepts in 3D. SkillsUSA will be integrated into the lesson plans to facilitate collaboration and career goals. Web Applications 1 – This course will introduce students to basic principles and standards of web design. Topics include a basic understanding of HTML, website planning, Cascading Style Sheets (CSS) to build the design layout for a website, create image and animation asset using graphic software. CSS will be utilized to create style appearance, and web authoring software will be used to facilitate the building of a website. Students will learn how to create animation for the web and how to make a video that is web compatible. Critical thinking and analysis is part of being a good web designer. Students will be given the opportunity often to reflect on their work and demonstrate their understanding of key concepts in web design. SkillsUSA will be integrated into the lesson plans to facilitate collaboration and career goals. Software Engineering 1 – This course uses game design and development to introduce students to the basics of computer programming. Emphasis is on defining game objectives, game story, character development, graphic development, basic programming, game mechanics, testing, and revision. Students will design, create and publish multiple game programs. Completion of both semesters with a grade of “C” or better qualifies the student for concurrent enrollment credit for CSC126 – Game Design and Development at Arapahoe Community College. Software Engineering 2 – This course is modeled as a college-level introduction to computer science, with a focus on object-oriented program development and applying math skills to computer programming. The course includes more in-depth study of problem definition, program design, object-based development, programming constructs, program analysis, data structures, standard algorithms, and computer ethics. Multiple programming languages will be used and students will design and develop multiple major programs. Completion of both semesters with a grade of “C” or better qualifies the student for concurrent enrollment credit for CSC119 – Introduction to Programming at Arapahoe Community College. Pathways Engineering – This is the Capstone course for students in Software Engineering, Web Design, or 3D Design. There are three primary focus areas: a senior technology project, a CCT on-line portfolio, and post-secondary planning. The senior project can be completed individually or as part of a team. A framework created by the Project Management Institute is used to document the project planning process and students may enter their project in the High School Project of the Year competition to compete for college scholarships. Post-secondary planning will include college applications, visiting with colleges and scholarship applications. The CCT portfolio will show off each student’s best work while in the CCT program. Beginning Robotics – This dynamic Beginning Robotics course will introduce students to the exciting world of mechanical engineering, industrial design, and computer programming. Using the Tetrix Robotics building platform with the Android communication system and Java programming, students will build robots that solve the annual FIRST Tech Challenge, and have a chance to compete with other students across the nation. Working in teams, this class will not only prepare students for the upper level CCT Magnet Robotics classes, but also give them a strong foundation for in careers in robotics, engineering, programming, and project management. Advanced Robotics – In this advanced technology class students get to work with Tetrix, and other robotics kits and components. Students learn basic programming with LabVIEW as well as more advanced JAVA programing language. These students will gain understanding in project management for robot construction and operation as well as experience FTC regional and national competitions utilizing Modern Robotics components. Working in teams, this class will not only prepare students for the Pathways CCT Magnet Robotics class but also give them a strong foundation for careers in robotics, engineering, programming, and project management. Pathways Robotics – In this career pathways technology class students get to work with advanced robotics kits and components. Students learn high level programming with LabVIEW, Java and ROBOT-C and gain understanding in project management for robot construction and operation. Students will participate in BEST and FRC Robotics competitions, design, build and maintain original FRC style robots, work on group dynamics, manage budgets, and develop sponsor relationships. Working in teams, this class will give students a strong foundation for careers in robotics, engineering, programming, and project management.